Laura's Review Bookshelf: SKYSHIP ACADAMY: NEWS!!! Nick has an upcoming ustream chat. It'll be on next Thursday the 8th (release day!) at 3PM pacific/5PM central/6PM eastern. Also, if you're on twitter--we're tweeting under #skyshiptour. 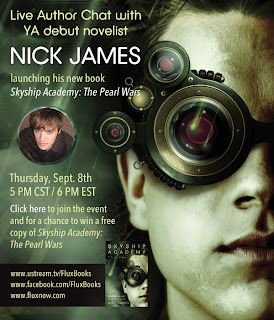 Come join Nick on his live chat! Should be a blast!